Nothing says ‘Melbourne’ more than its yellow and green trams, and they’ve never looked more adorable than this. Newcomers Make Me Iconic have taken on the usually tacky world of souvenirs with the launch of their Iconic Toy Tram. The beautifully-crafted wooden tram holds a certain nostalgia, both as a reminder of the city’s history and of a time when toys required no batteries. 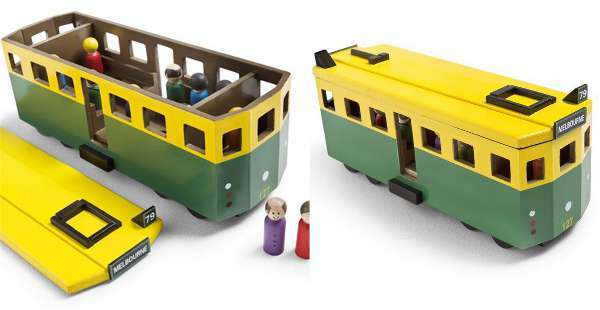 Based on the W-class Melbourne tram, this colourful creation comes with twelve wooden passengers, two tram conductors and a removable lid, providing endless opportunities for imaginative play. The tram is $90, with free postage thrown in. It’s well worth taking a look at some of Make Me Iconic’s homewares, including cushions, tea towels and artwork, featuring some of Melbourne’s most-loved landmarks, including the Skipping Girl and Nylex signs. And the Sydney versus Melbourne debate is sure to be reignited, albeit in a rather comfy way, with these cushions.